When I worked corporate, office wear was snoozeville. Options were very neutral and existed in limited, sometimes unflattering, cuts unless you chose to pony up for a custom tailored power suit. Furthermore, business casual was best reserved for Fridays...if then. These days, office wear has definitely stepped up its game both in terms of the range of silhouettes available, but also in terms of what's acceptable on the job. Of course, creative types have always had this freedom of self-expression, but now ladies in more traditional industries are having fun with their style while keeping it profesh, of course. The crisp button down shirt has it's place, but under a blazer or a cardi, a blouse is just as polished and adds a little more personality. In a trendier style, it really is the easiest way to update your current office look if you're not planning to invest in a bunch of new pieces. My picks from left to right: Print Short Sleeve Sweater via Joe Fresh, Cobalt Sleeveless Peplum via Smart Set, and Sheer Colour Block Blouse via The Bay. 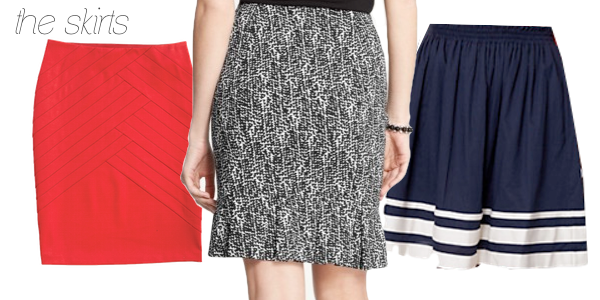 While the pencil skirt is a classic staple, it doesn't have to be your only option, nor does it have to be hard to wear. 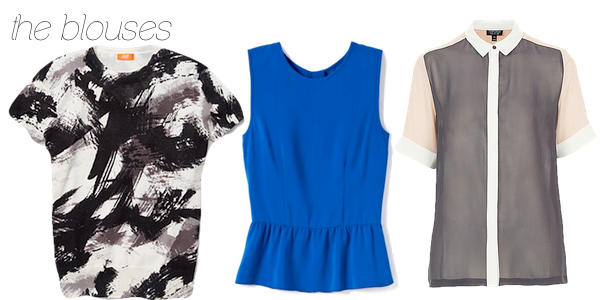 Opting for a fuller hemline or even just a little flounce helps balance figures that are broader or bustier on top. If you want a pencil to be slimming and comfortable find one with details to create a waist cinching illusion in a fabric that has a little lyrca or jersey blend. My picks from left to right: The Original Comfort Skirt via Reitmans, Graphic Glimpses Print Flounce Skirt via Ann Taylor, Shirred Striped Skirt via Anthropologie. 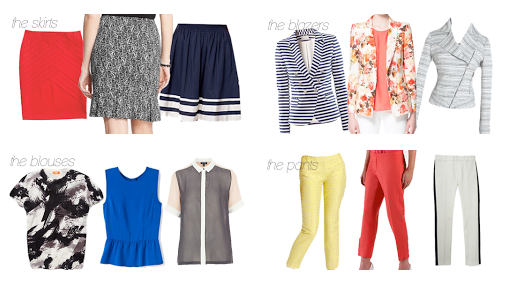 I think blazers offer the biggest potential for creating a more fashion forward office look. They make a huge statement but as long as you keep the rest of your look very subdued and neutral, you'll still look every bit the corporate giant. The big bonus is that you can rock this look on the weekend with jeans or after work for sept à cinq with just a few changes. 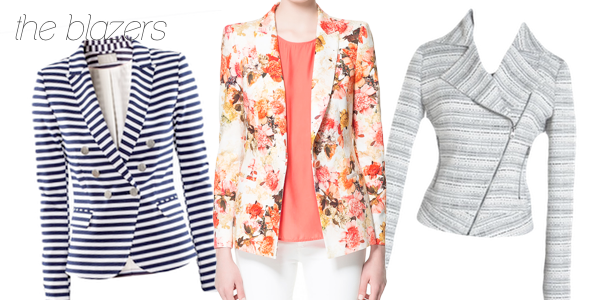 My picks from left to right: Striped Double Breasted Jacket via H&M, Floral Boyfriend Blazer via Zara, Perfecto Tweed Jacket via Jacob. For spring and summer I just love a cropped or ankle pant. It's a little more relaxed, but in a slim fit still looks tailored and works great with the cute ballet flats and kitten heels that are all over the shops. 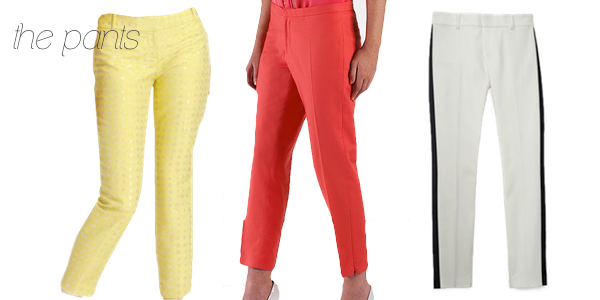 A bright pant is a great option to add some life into your work wardrobe but if you're not ready to go there, try neutral shades with detail like a small graphic print or a tuxedo stripe. My picks from left to right: Zoe Skinny Cropped Pants in Lurex Jacquard via LOFT, Slim Ankle Pant in Poppy via Moon Apparel, Sarah Tuxedo Crop Pants via Club Monaco. Tips: Unless you're quite confident that a new love of brights, prints and non-traditional silhouettes is A-Okay at your office, it might be wise to start with just one new eye-catching piece paired with more conservative ones. Also be sure to keep the look very tailored and modest -- no deep v-necks or short skirts to avoid being noticed in the wrong way. 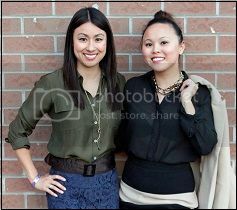 -- Tamika Auwai is our resident Style Editor, Shopping Enthusiast and Wardrobe Expert.